IRON HYDROGENATED DEXTRAN INJECTION is a sterile solution containing 100 mg of elemental iron per mL, stabilized with low molecular weight hydrogenated dextran and 0.5% phenol as a preservative. 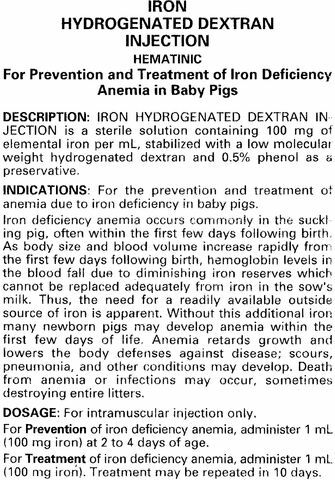 For the prevention and treatment of anemia due to iron deficiency in baby pigs. Iron deficiency anemia occurs commonly in the suckling pig, often within the first few days following birth. As body size and blood volume increase rapidly from the first few days following birth, hemoglobin levels in the blood fall due to diminishing iron reserves which cannot be replace adequately from iron in the sow's milk. Thus, the need for a readily available outside source of iron is apparent. Without this additional iron many newborn pigs may develop anemia within the first few days of life. Anemia retards growth and lowers the body defenses against disease; scours, pneumonia, and other conditions may develop. Death from anemia or infections may occur, sometimes destroying entire litters. For Prevention of iron deficiency anemia, administer 1 mL (100 mg iron) at 2 to 4 days of age. For Treatment of iron deficiency anemia, administer 1 mL (100 mg iron). Treatment may be repeated in 10 days. Disinfect rubber stopper of vial and injection site with a cotton ball moistened with rubbing alcohol or other suitable disinfectant. Use a small needle (20 gauge, 5/8 inch) and syringe that have been sterilized by boiling in water for 20 minutes. Injection should be made intramuscularly into the back of the ham (see diagram below). Apply tension to the skin at the injection site by pulling skin and fat downward with pressure from the thumb or fingers. Inject into the muscle to a depth of approximately 1/2 inch. Use a clean, sterile needle and syringe for each pig to avoid spreading infection. If disease or abnormal condition is suspected, consult veterinarian before administration. Occasionally pigs may exhibit a reaction to iron injection, clinically characterized by prostration and muscular weakness. In extreme cases, death may result. NOTICE The intramuscular injection of organic iron preparations into pigs beyond 4 weeks of age may cause staining of muscle tissue. 100 mL multiple dose vials. Prevention : 1 mL (100 mg iron) at 2 to 4 days of age. Treatment : 1 mL (100 mg iron). Treatment may be repeated in 10 days. 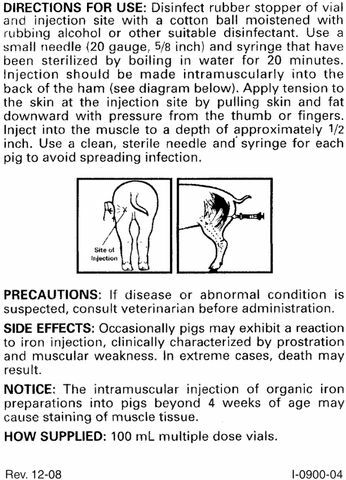 NOTICE : Organic iron preparations injected intramuscularly into pigs beyond 4 weeks of age may cause staining of muscle tissue. See accompanying leaflet for additional information. Each mL of sterile solution contains 100 mg of elemental iron stabilized with a low molecular weight hydrogenated dextran and 0.5% phenol as a preservative. Store at a controlled room temperature between 15 o and 30 o C (59 o - 86 o F). TAKE TIME OBSERVE LABEL DIRECTIONS.